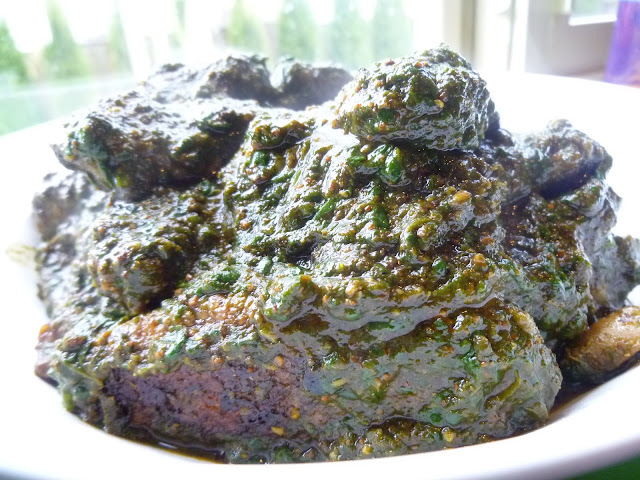 Chicken cooked in spinach Gravy. Spinach/Palak is a very good source of iron , many other vitamins and calcium but oxalate present in it binds with calcium and hinders its absorption so it is not considered a good source of calcium.And chicken has become very popular in the recent times.And the combo of this two is wonderful. I loved this recipe because it is very different from the regular chicken preparation . Palak in the palak murg or palak chicken gives it a unique taste and color. I found palak chicken a perfect for party dish , quick to prepare ,very few ingredients and fancy too :). Add turmeric, salt ,oil, lemon juice and ginger garlic paste to chicken. Mix well and marinate for few hours in fridge. Clean the spinach and pick good leaves. Boil a big pot of water and drop in the leaves and green chili. Cook for just a minute and drop in chilled water or ice to retain the green color. Drain and blend coarsely and keep aside. Heat the butter and add cloves , cinnamon and bay leaf. Add onion and cook till pink and add the marinated chicken. Lightly brown the chicken pieces and add half 1/2 cup water . Bring to boil , cover and cook till the chicken is done on medium heat. Add the pureed spinach and garam masala and simmer for 3-5minutes. Check for salt and serve with naan or roti. Wonderful palak chicken, loved the texture of your gravy, just yummilicious. I just love recipes with a combo of chicken and spinach. These ingredients can be found at my place and its like the perfect dish which I am drooling over.